Location: Hawara, Egypt. Grid Reference: 29.274° N, 30.901° E.
The Great Labyrinth of Egypt: (The 'lost Labyrinth'). It has been announced this year that the 'lost labyrinth' of Egypt at Hawara has been re-discovered by an expedition funded by NRIAG, Ghent University/Kunst-Zicht & Louis De Cordier, with the cooperation of the Supreme Council of Antiquities, Horus Foundation & Isel Foundation. This colossal temple was described in the past by authors such as Herodotus and Strabo, and was said to contain 3,000 rooms full of hieroglyphs and paintings. Long thought of as another legend without foundation, it seems that the building, lost for over 2000 years, has been recently re-discovered. Underneath this upper zone, below the artificial stone surface appears (in spite of the turbid effect of the groundwater) at the depth of 8 to 12 meters a grid structure of gigantic size made of a very highly resistant material like granite stone. This states the presence of a colossal archaeological feature below the labyrinth “foundation” zone of Petrie, which has to be reconsidered as the roof of the still existing labyrinth. A geophysical survey of the area has revealed the presence of 'vertical walls' under the stone surface at the depth of 8 to 12 meters, connecting to form a gigantic grid structure made of granite. The grid structure of the labyrinth is offset 20° to 25° to the orientation of the nearby pyramid at Hawara. It was written that an underground tunnel connected the two structures. Should this discovery become substantiated as Herodotus famed 'Labyrinth', (and the roof rather than the base), then it will rank alongside other great discoveries of our times, and will become one of the architectural jewels in Egypt's crown. Congratulations to Monsieur de Cordier and all involved. The 1st century BC Greek geographer Strabo is the only other ancient eyewitness of the Egyptian Labyrinth whose account has survived. Strabo said of it that it was "a great palace composed of many palaces" and marvelled at enormity of the stone slabs that made up its roof and walls. He wrote that it had many great courts, each with its own entrance, but that "in front of the entrances are crypts, as it were, which are long and numerous and have winding passages communicating with one another, so that no stranger can find his way either into any court or out of it without a guide." "All over an immense area of dozens of acres, I found evidence of a grand building," he wrote. Petrie could only guess that this structure once measured an enormous 1,000 by 800 feet, and he summed up his findings quite succinctly: "From such very scanty remains it is hard to settle anything." The idea that such a discovery derived from artistic creativity rather than academic or scientific research was warmly embraced at the lecture at Gent university. The refreshing sight of scientists, artists, scholars, academics and philosophers coming together temporarily bridged a gap that is sadly lacking in the modern times, but that is exactly what Louis de Cordier has done. In a triumph of artistic instinct he has led the way to one of the great Egyptian discoveries of our age. The 'Labyrinth' plays a special role in human history, believed by many to contain the wisdom of the ages, we can see the same theme repeated around the ancient world. When Diodorus made his claim that the Minoan labyrinth was a scale model of the Egyptian one, he had not had the luxury of visiting it as had Herodotus before him. We are now close to sharing that privilege in the near future thanks to Louis and everyone else involved in the Hawara project. Results: (Read by Dr. Abbas Mohamed Abbas). 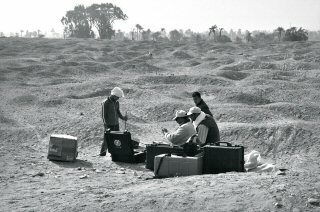 - The results of several sub-surface surveys GEM, VLF, TEM, GDR, ERT, MAG), have supported each other in the conclusion that a structure (structures), exist beneath the 304x24m stone surface already identified by the south face of the pyramid of Amenenhat III of the twelfth dynasty. Beneath this slab, a limestone foundation is suspected with symmetrical features orientated in a NW-SE direction. This is contrary to historical records by around 20°. Vertical walls and several granite objects have also been identified but further results have been hampered by the influence of the ground-water-table, which is one of the major problems faced by the restoration team who will have to find a way of draining the soil of the saline water which is currently destroying the remains through chemical reaction. The Future: Dr. Ghamrawy has been charged with the responsibility of saving the Labyrinth, the pyramid of Amenenhat III, and in fact, the whole complex. The site has already suffered the indignation of having a canal (The Whabi canal), built through the middle of it, electric pylons and the general effects of having the sprawling metropolis of Hawara on your doorstep. Dr Ghamrawy projects himself as more than capably equipped for the task ahead and we wish him good luck. A joint Polish/Egyptian team is preparing for further analysis of underground anomalies round the north, south and east faces of the pyramid. Discoveries are at present on display in the 'open-air' museum at the site. 1). Herodotus, The Histories, Translated by Aubrey de Selincourt, Book II, pp. 160-61.